FrutArt. Fruit Carving. Vegetables Carving and garnish. For fairs and decoration.Classes, lessons, teaching, formation. Sculpture. 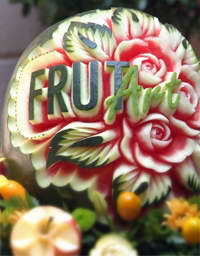 FruitArt. Fruit Art. We are a company dedicated to the decoration, formation and advising in gastronomical matter. Our will to improve the habits and the aspect of the gastronomical surroundings has taken to us to offer our services to the community. Like professional, we can offer our works and presentations, as well as the most advanced formation in decoration techniques. Like individual, services of catering, decorations and mini-courses to know the beautiful world fruit carving. Our experience in fairs, events and customized formation guarantee to us. - We returned from Thailand. Thanks to Dungronsak Master and Tum.